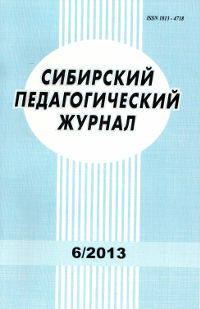 The full name of the reviewed scientific periodic printed edition – «Siberian Pedagogical Journal». The founder of the reviewed scientific periodic edition – Federal State Budgetary Educational Institution of Higher Education Novosibirsk State Pedagogical University. The year of foundation of the reviewed scientific periodical edition – 2003. Address of the official site (site pages) of the reviewed scientific edition in the information-telecommunication network - Internet: http://sp-journal.ru/. The territory of distribution of the journal – The Russian Federation. "Siberian Pedagogical Journal" is included in the Russian science citation index (РИНЦ) and Ulrichsweb Global Serials Directory. "Siberian Pedagogical Journal" is included in the List of leading reviewed scientific journals and publications, in which the main scientific results of dissertations for application on such scientific degrees as doctor and candidate of Sciences. Since the year 2013 the frequency of releases of the journal - 6 times a year. Distributed by subscription and retail. © Federal State Budgetary Educational Institution of Higher Education «Novosibirsk State Pedagogical University», 2016. © Siberian Pedagogical Journal, 2016. The Siberian Pedagogical Journal is included in the "List of leading reviewed scientific journals and publications, in which the main scientific results of dissertations on competition of scientific degrees of doctor and candidate of Sciences should be published" of the HAC of RF.